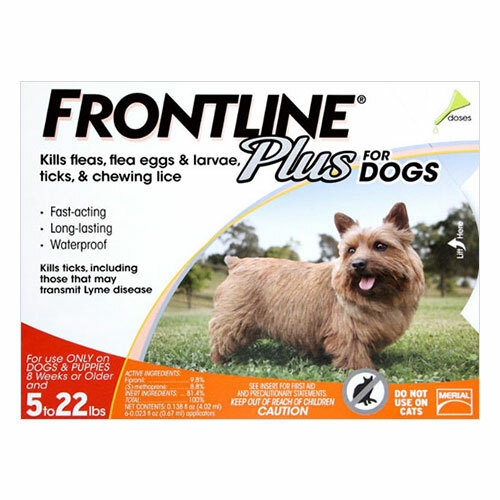 Frontline Plus is a topical treatment for puppies (at least 8 weeks of age) and dogs that protects them from fleas and ticks. It is an effective remedy that kills 100% of fleas on the dogs within 12 hours of application and 100% ticks and chewing lice in 48 hours. It efficiently eliminates brown dog tick, the American dog tick, lone star tick and deer ticks. It also destroys the flea life cycle by killing flea eggs and flea larvae. Frontline Plus an effective aid consists of Fipronil and (S)-methoprene. Fipronil is an insecticide, which acts as a poison by destroying the working of the nervous system of the fleas. (S)-methoprene is an insect growth regulator that kills flea eggs and larvae. These active ingredients when combined provide full-on protection for the dogs and safeguards tem from the parasitic re-infestations too.